Words that strike a small sense of terror into every law student. The test that determines whether or not you will be allowed to practice law. The test that quite literally determines your future. If you want to be a lawyer and you are not thinking about the bar exam, you should start now. My law school starting prepping us for the bar exam right in orientation. Bar exam passage has been low universally among all law schools the last few years so they wanted us to start off strong and do everything we could to prepare over our three years in law school for the bar exam. The strategies they implemented included requiring all students to complete classes in bar tested subjects, multiple choice questions on all exams, semester check in's on where we should be in our bar prep process and a professor dedicated to helping us with bar exam questions. One of the most important parts of the bar examination process is choosing a company for your bar exam preparation course. Basically, if you graduate in May and take the bar exam in July, you spend those 3 months studying basically nonstop for the exam. The most effective way to do this is with an intensive commercial bar preparation course. Some of the most popular companies are Themis, Barbri, and Kaplan. These intensive bar preparation courses provide you will condensed instruction on the relevant black letter law, practice multiple choice questions, practice essay questions, essay grading, support staff and test-taking strategies to excel on the exam. The downside to these courses is that they are not cheap... it will run between $1,500-2,500 for a commercial bar prep course. While most realize that the must invest in one of these prep courses, many people aren't sure how to choose between them. 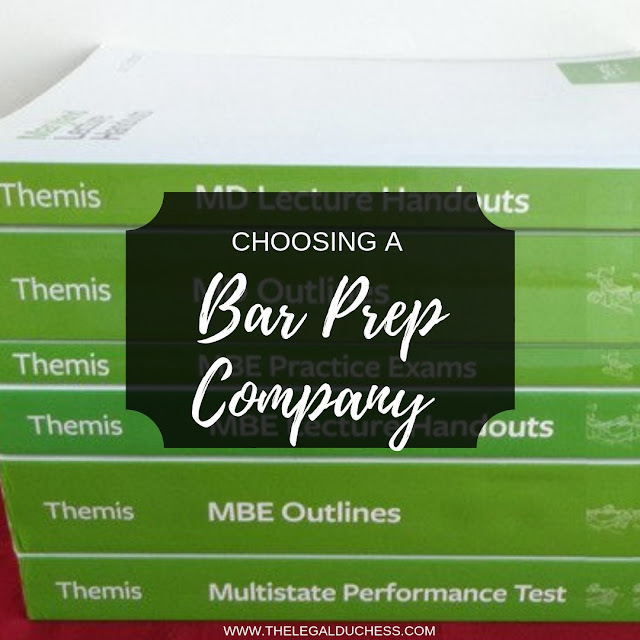 I am going to explain the process I used to make my decision on which bar prep company to use and some tips for saving a little money in the process. Not every company published their pass rates. Personally, I made sure to choose a company that publishes so I know what I am getting into and what my chances are. Bar prep companies often offer some sort of scholarship for people who work in public interest. I know for a fact Themis offers a scholarship for this. Schools generally have student representatives for each bar prep company so ask them about getting signed up for a scholarship if available. Another way to save money on a bar prep course is to lock it in early. Many bar prep companies offer specials throughout the year and I have noticed they tend to be cheaper in the Fall. Put a deposit down early when there is a good special happening and then you lock in that price. Many of my friends locked in their bar prep during 2L Fall semester. A less common way to save money on bar prep is to become a student representative for a specific bar prep company. Every school is a little bit different so inquire with current student rep's or the company rep for your school to get this. As a student representative, you can often get a heavily discounted or free bar prep course. I became a representative for Themis Bar Review during my 1L year because of my experience with their 1L essentials (more on that later). I have tabled and discussed Themis with my fellow students once a week over my 3 years in law school and then I will get my bar prep course for free! Another important thing to consider is what study and learning style works best for you. All bar prep courses from different companies differ slightly in the method and style of learning. Something to consider is if you prefer an in class or on your own prep course. Themis is done 100% online from your computer and wherever you choose to study whereas Barbri offers in-class sessions. Personally, I prefer to study from my home office, in my PJ's and with my puppies by my feet; the Themis program that is 100% online will work well for me. I have a few friends who feel they need the structure of in-class review so they chose Barbri. Know yourself and what works for you and choose the course that fits with that the best. My suggestion for figuring out which course one you like the best/works best for you is to try out their free materials. Themis offers free 1L essentials, upper-level essentials and an MPRE course in the same style and format as their bar prep course. Barbri offers free MPRE materials and so does Kaplan. If you can actually dig into the program and see how you like it an application, you will know better which one you want to spend three months with studying for the bar exam. Obviously, I am still in my 3L year so I have not taken the bar exam yet to know if I made the right choice. What I can say is this is the process I used to make the choice on which bar prep company to use for the prep course.